This motorcycle trip is designed to take you through the best mountain passes in Bulgaria and Romania - Petrohan pass, Shipka pass with magnificent views from its 1190 m summit and the Shipka Memorial representing one of the most important victories in Bulgarian history, Transfagarashan and Transalpina - the highest road in Romania, located in the Parâng Mountains that will amaze you with its breathtaking high altitude natural setting. Transfagarashan on the other side is one of the most spectacular roads inthe world, climbing at about 2000 meters above sea level, crossing the Carpathian Mountains in Romania. You will enjoy its 90 km of twists and turns running north to south between the highest peaks of the Southern Carpathians. You will visit the famous Belogradchik Rocks Natural phenomenon in northwest Bulgaria, declared a natural landmark for its impressive sandstone and limestone rock formations, the world-famous Dracula castle in Bran, the beautiful town of Sibiu, the intriguing Buzludzha UFO, and the old capital of Bulgaria - Veliko Tarnovo, with its imposing Tsarevets Fortress, citadel of the Second Bulgarian Kingdom. 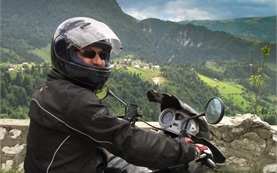 Bulgarian Mountains Motorcycle Tour stretches over four Bulgarian mountains - Balkan Range, Rila, Pirin, and Rhopdopes. 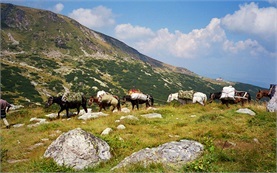 Enjoy the scenic splendors of Bulgaria, called by "New York Times" the sleeping beauty of the Balkans. 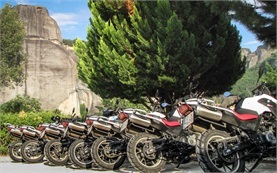 All routes are thoroughly selected to give you the best panoramic views from Bulgarian nature - winding river gorges, green meadows, beautiful lakes, pre-historic caves, hidden old villages and breathtaking waterfalls.